It was an unlikely pairing. Legendary crooner Bing Crosby and rock sensation David Bowie were about the last two people you'd ever expected to see doing a duet together. But it was incredibly effective, and incredibly popular, when they united voices on the old holiday standard The Little Drummer Boy. An instant classic, Crosby and Bowie unknowingly created one of the most played holiday songs ever. It seems fitting in a way. After all, Crosby is the man who made White Christmas the seasonal sensation it has been ever since he first sang it in the film Holiday Inn. Known for his smooth delivery of standards over the decades, Bing had been doing holiday specials for years when his producers decided to invite the more contemporary, the utterly British, and the extremely flambouyant Bowie onto his show. Some folks even found it humorous. Yet these two singers, poles apart in style, made history. 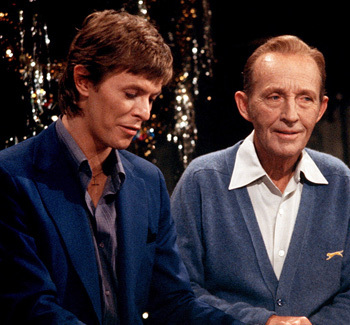 The clip from that now classic special of Bing Crosby and David Bowie singing The Little Drummer Boy still evokes feelings of nostalgia and holiday spirit in even the most casual listener. It's fun to watch, especially their patter in the beginning, but when they begin to sing the magic is still made for a new generation of listeners every time it plays. 1787 - New Jersey became the third state to ratify the U.S. Constitution. 1796 - The "Monitor," of Baltimore, MD, was published as the first Sunday newspaper. 1862 - The first orthopedic hospital was organized in New York City. It was called the Hospital for Ruptured and Crippled. 1865 - Slavery was abolished in the United States with the 13th Amendment to the U.S. Constitution being ratified. 1898 - A new automobile speed record was set at 39 mph (63 kph). 1903 - The Panama Canal Zone was acquired 'in perpetuity' by the U.S. for an annual rent. 1912 - The U.S. Congress prohibited the immigration of illiterate persons. 1912 - The discovery of the Piltdown Man in East Sussex was announced. It was proved to be a hoax in 1953. 1915 - U.S. President Wilson, widowed the year before, married Edith Bolling Galt at her Washington home. 1916 - During World War I, after 10 months of fighting the French defeated the Germans in the Battle of Verdun. 1917 - The Eighteenth Amendment to the U.S. Constitution was passed by the U.S. Congress. 1935 - A $1 silver certificate was issued for the first time in the U.S.
1936 - Su-Lin, the first giant panda to come to the U.S. from China, arrived in San Francisco, CA. The bear was sold to the Brookfield Zoo for $8,750. 1940 - Adolf Hitler signed a secret directive ordering preparations for a Nazi invasion of the Soviet Union. Operation "Barbarossa" was launched in June 1941. 1944 - The U.S. Supreme Court upheld the wartime relocation of Japanese-Americans, but also stated that undeniably loyal Americans of Japanese ancestry could not be detained. 1950 - NATO foreign ministers approved plans to defend Western Europe, including the use of nuclear weapons, if necessary. 1956 - Japan was admitted to the United Nations. 1957 - The Shippingport Atomic Power Station in Pennsylvania went online. It was the first nuclear facility to generate electricity in the United States. It was taken out of service in 1982. 1963 - Ron Clarke set a world record when he ran six miles in 28 minutes and 15.6 seconds. 1965 - Kenneth LeBel jumped 17 barrels on ice skates. 1969 - Britain's Parliament abolished the death penalty for murder. 1970 - Divorce became legal in Italy. 1972 - The United States began the heaviest bombing of North Vietnam during the Vietnam War. The attack ended 12 days later. 1973 - The IRA launched its Christmas bombing campaign in London. 1979 - The sound barrier was broken on land for the first time by Stanley Barrett when he drove at 739.6 mph. 1983 - Wayne Gretzky (Edmonton Oilers) scored his 100th point in the 34th game of the season. 1984 - Christopher Guest and Jamie Lee Curtis were married. 1987 - Ivan F. Boesky was sentenced to three years in prison for plotting Wall Street's biggest insider-trading scandal. He only served about two years of the sentence. 1996 - Despite a U.N. truce, factional fighting in the Somali capital of Mogadishu, broke out in which at least 300 fighters and civilians were killed. 1998 - The U.S. House of Representatives began the debate on the four articles of impeachment concerning U.S. President Bill Clinton. It was only the second time in U.S. history that process had begun. 1998 - Russia recalled its U.S. ambassador in protest of the U.S. attacks on Iraq. 1998 - South Carolina proceeded with the U.S.' 500th execution since capital punishment was restored. 1999 - After living atop an ancient redwood in Humboldt County, CA, for two years, environmental activist Julia "Butterfly" Hill came down, ending her anti-logging protest. 2001 - Mark Oliver Gebel, a Ringling Bros. Circus star, went on trial for animal abuse. The charges stemmed from an incident with an elephant that was marching too slowly into a circus performance on August 25, 2001. He was acquitted on December 21, 2001. 2001 - A fire damaged New York City's St. John Cathedral. The cathedral is the largest in the United States. 2001 - In Seattle, WA, Gary Leon Ridgeway pled innocent to the charge of murder for four of the Green River serial killings. He had been arrested on November 30, 2001. 2002 - Nine competing designs for the World Trade Center site were unveiled. The Lower Manhattan Development Corp. expected to choose a design by January 31, 2003. 2003 - Adam Rich was arrested for driving onto a closed section of Interstate 10 and nearly struck a California Highway Patrol car. 2009 - General Motors announced that it would shut down its Saab brand. 2009 - A Paris court ruled that Google was breaking French law with its policy of digitizing books and fined the company a $14,300-a-day fine until it rids its search engine of the literary extracts. 2010 - James Cameron's movie "Avatar" was released in the United States. On January 26, the movie became the highest-grossing film worldwide. Tango In The Night is one of Fleetwood Mac's most successful studio albums. Released in 1987, this LP returned the Mac to the top of the charts and was their first effort since their self titled 1982 album. Boasting four Top 40 hits, the biggest one was Little Lies. Written by Mac member Christine McVie, with her mellow lead vocals powering the track, it climbed into the Top 5 with ease and became one of the group's greatest hit singles. Little Lies is a true masterpiece of a track. It makes the listener snap to attention almost effortlessly. With backing vocals by Lindsey Buckingham and Stevie Nicks, Christine's delivery of the lyrics is impeccably accentuated. Radio played this one to death back in its day, and still does for that matter, because Little Lies commands airplay. Cash registers chimed like musical instruments to the sale of the single. A concert favorite, the Mac always thrills fans whenever it performs this one. All the audience needs to get going is to hear the opening chords of this classic. The video was also a gem. Christine McVie always could hold her own with her bandmates but never more so than here. Little Lies sounds as good today as it did over twenty years ago.